Replacement casters are a must if you have mobile displays! 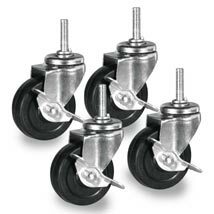 All casters for clothing racks include brakes. 3 in. casters measure 3/8 in. - 16 x 1 1/2 in. with a threaded stem. Casters will hold up to 75 lbs. Sold in sets of 4. For more offerings, we invite you to take the occasion to review our whole inventory of retail clothing racks for sale at Specialty Store Services now. 3 in. x 3/8 in w x 1 1/2 in h.